Automatic cap electromagnetic induction aluminum foil sealing machine takes the electromagnetic induction principle as a basis. The aluminum foil makes bow wave and become heat, then the membrane will melt and adhere to the opening of the PE, PET bottles, and then make bottles sealed. The high stress resistance components are quite reliable and the specification is wide. It can be widely used for the sealing of abnormal bottles and big size mouth bottles. The circulating water makes cooling, The machine does not touch the bottle when sealing, Meet GMP requirements. Unique tunnel design with patents, the induction sensor can increase the sealing speed. The induction sensor can be can be rotated, in order to accommodate larger seal diameters.Small cap bottles and large cap bottles can be sealed by one machine, saving the cost. Height of induction sensor is adjustable and flexible for a range of bottle height. Sealing Fast and efficient. The induction heating foil seals tightly without being affected by moisture, grease or powder contamination on sealing area. Full modular component design, can be against moisture, erosion, dust and magnetism, minimizes maintenance requirements and increase the rease. With the special alarm system, the machine will alarm when the tank water less, water temperature high,low voltage, over current, overload, output line not connected. The induction controller adopt the latest imported Field Effect Transistor and CPU module control. With 4 wheels under the machine body, it is very easy to move. 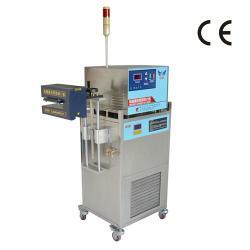 The induction sensor and main unit of same machine model can be change. Missed foil cap rejector(optional).The bottle stop automatically stops the seal to avoid the inflammable material trapped in the magnetic and thermal range of the sensor to be heated and fired.